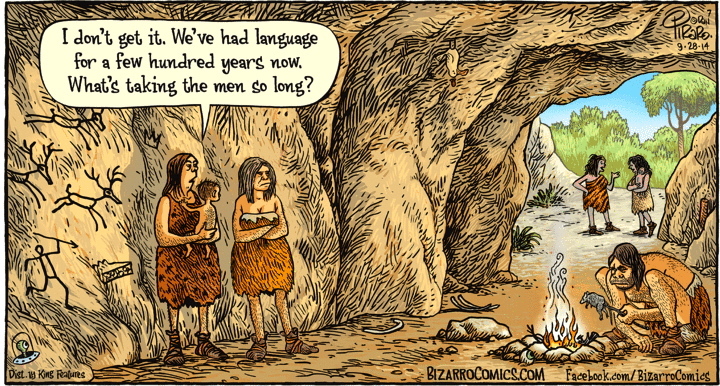 The strip shows the origin of language in male humans substantially lagging that in females, as if the sexes were different species — a preposterous idea when you examine it with any care. But the strip plays on a real phenomenon, that the acquisition of language in boys tends to lag somewhat behind that in girls. Boys speak later, and less, than girls, common wisdom has it. Well, common wisdom isn’t exactly wrong, but it treats, inaccurately, what is in fact a small statistical difference between the sexes (which largely overlap with one another) as an absolute gap. And there’s certainly no reason to think that phylogeny recapitulated what we know of ontogeny. This entry was posted on September 28, 2014 at 5:04 am and is filed under Language, Language acquisition, Linguistics in the comics. You can follow any responses to this entry through the RSS 2.0 feed. You can leave a response, or trackback from your own site.